This team used cutout squares with #PublicSediment and creek related symbols (people walking, fish, wildlife, sea level rise, etc). 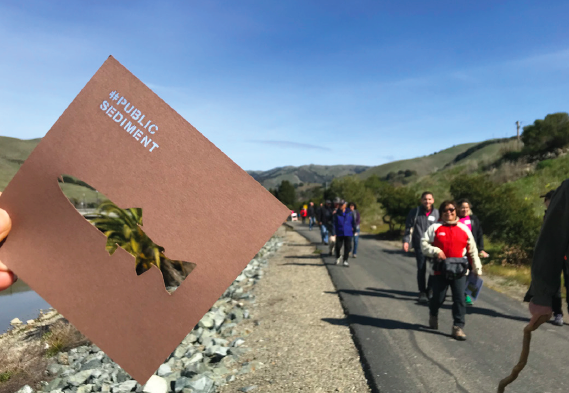 The goal of the cutouts was to increase social media presence and help the public visualize what they want to see in a resilient Alameda Creek. Pick relatable symbols as cutouts and use a laser cutter or x-acto blade to cut out shapes from cardboard squares. Make sure the squares are something people can easily hold in their hands. Have people hold up cutouts, document how they see their creek, and share on social media.